Safety Bed Rail & Padded Pouch adds a support rail to a bed gives caregivers peace of mind because it helps keep loved ones safe. 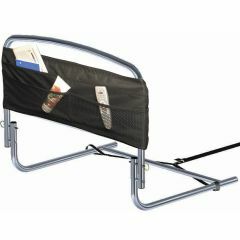 Standers’ 30" Safety Bed Rail & Padded Pouch works well as a side rail for preventing falls, and as a support bar for getting in and out of bed. It also includes a bumper pad with an 8-pocket organizer pouch that is perfect for keeping handy items close by. The rail folds down and out of the way when it isn't in use - a great feature when it's time to make the bed. Can be installed on either side of the bed in between the mattress and box spring. It attaches to the bed frame with a dual safety strap which provides stability and keeps it from getting bumped out of place. Works on any size home or hospital bed and at 23” high will accommodate taller pillow top mattresses. used once,bolt fell out,fell apart fast. would not reccomend. I just wanted to say thank you for such quick delivery to my father. He just got out of the hospital from not being able to eat and his sugar was so low. The doctor told us to get him Resource and I ordered a case yesterday with reg. ground shipping and he just called me today that he already received his order today. I was amazed and we are both excited to see how well this product helps him.